Scene in Clovis, NM. The alleged gunman was 16 years old. 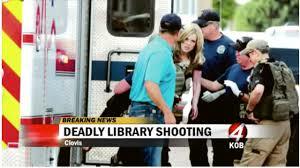 On Monday, Aug. 25, a gunman opened fire on patrons of a library in Clovis, New Mexico, killing two and wounding four others. That marked the 244th mass shooting of 2017, and that was before the horror in Las Vegas in which, as of this writing, 58 people have been confirmed dead and over 500 wounded. This and many other such acts have caused uncountable heart ache, just as similar actions have all around the world. Whether it be the grieving families of those lost in Las Vegas, or of the Rohingya in Myanmar or the survivors of the 500,000 killed in Syria, suffering is suffering, and the country in which it occurs makes no difference. But in the case of the Las Vegas shooter, there are particular political ramifications, and if the “senseless” deaths are to mean anything, we must consider these politics. 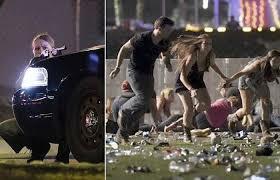 Scene in Las Vegas as attendants at a country and western concert flee in panic. Just days before the Las Vegas terrorist act, Republicans introduced a bill in Congress legalizing gun silencers. The bill would also mean that a resident in a state where concealed carry is legal for (nearly) anybody could carry a concealed weapon into another state where it is illegal. This bill is in some ways the equivalent of the Supreme Court’s Dred Scott decision of 1857. In that case, the Supreme Court determined that a slave owner could bring his or her slaves into a state where slavery was outlawed and those slaves would remain in that status. So where were all the hypocritical cries of “states’ rights” when that bill was introduced? This from a man who systematically whipped up crowds to a violent frenzy during his election campaign last year, a man who defended violent fascists less than a month ago, a man whose rhetoric contains appeals to violence on a daily basis. Socialists and workers in general should understand what “national unity” really means; it means that workers must follow the interests of the capitalists, but even with this understanding, it would be laughable if it weren’t so nauseating to hear Trump appeal for such unity. And you know if it had been a black or Latino person accused of this crime, Trump would be denouncing the entire black community or all Latino immigrants. And heaven help us if it had been a person with a Muslim name! Meanwhile, one word that we did not hear from him – or from the capitalist media in general – was the word “terrorism”. It is guaranteed that if the apparent gunman had had an Arabic last name that word would be repeated ad nauseum. But what are we to make of this mass shooting and of the other 244 such incidents this year? Is it really simply an “act of pure evil”, as Trump and other capitalist politicians would have us believe? In that case, why are there so many purely “evil” people in the US and why weren’t there in years past, when this sort of thing didn’t happen? At this point nearly nothing is known about the apparent shooter, Stephen Paddock, a landlord, licensed airplane pilot and hunter. Although they searched, they could find no connections with Islamic terrorist groups. Was Paddock connected with any far right groups? No idea. Was he on some sort of medication? We have no idea. Why did this happen, then? What sense are we to make of it? It defies any serious, which is to say scientific, approach to see this act in isolation. To this writer, the explanation lies in the general level of anger and violence that exists in US society. 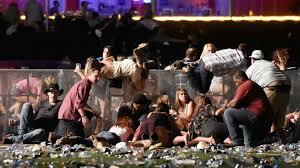 In Paddock’s case, he apparently had lost tens of thousands of dollars gambling in Las Vegas in recent weeks. It is easy to imagine him having been whipped up into fury over this loss. And since in the US we are taught to always take out one’s anger on others in a blind and violent way, it’s easy to imagine this process at work in this case. In other words, the background is the general level of unfocused anger and violence that is endemic to US society today. And the chain always snaps at the weakest link. Meanwhile, this horror will be used to increase the repressive apparatus in the US, which will only make matters even worse. Also, in this regard, it’s useful to learn a lesson from history: In 1946, the last labor general strike in the US happened in Oakland, CA. At that time, the chief of police reported that crime virtually disappeared. Another interesting response to the mass shooting in Las Vegas: This writer has heard two people say they didn’t believe that the accused gunman, Stephen Paddock, was the one who did it; they thought it was a set up. One person was a young white nurse. She didn’t seem to be a right winger. Just the opposite, in fact. Had a kind of punk hair style and seemed anti-establishment. I just overheard her in a situation where I couldn’t say anything. “Why?” I said. “What makes people think that a wealthy, middle aged white guy couldn’t do this? If it had been somebody with a Muslim last name, or somebody who wasn’t white, would we be thinking that?” He immediately agreed with me and then we had an excellent conversation about the social situation that allows for something like this, Trump, all the deaths elsewhere (such as in Syria). In other words, this was a thoughtful guy, not some nut case. But it just shows the level of complete distrust in all establishment sources, but a distrust that comes out in a very distorted way. Also, note that the Islamic State has claimed responsibility, but at this point that seems pure fiction. That means that not every act of terrorism for which they claim responsibility can be laid at their door. UPDATE: It is now being reported that Paddock may have been obsessed with getting his name out there like his father’s was. (His father was a bank robber and was on the FBI’s 10 most wanted list.) If, in fact, that was the main conscious motive, it again shows how human life has been cheapened in US society. The president can talk about wiping out an entire country (North Korea) and not a second thought is given to the human suffering involved. It also shows the obsession with celebrities that the media encourages (think: “You’re Fired!” and The Kardashians). This serves to lead people to live in a dream world rather than really take a look at the world around them. I’ve been thinking a little more about Paddock, the apparent shooter. He’s known to have had an extreme addiction to slot-machine poker gambling, although the capitalist media doesn’t call it an “addiction” out of concession to the gambling industry. He also was an alcoholic. Modern brain science shows that satisfying any addiction (including addiction to behaviors like gambling) stimulates the release of ever increasing amounts of dopamine and strengthens the role of the midbrain at the expense of the pre-frontal cortex. The former, called the “lizard brain” by some, is that part of the brain that just reacts. All animals have that part of the brain. The latter is the part of the brain that is responsible for logical thought, perception of more distant consequences – in short, the part of the brain that distinguishes our species, the human species. It is suspected – although far from confirmed – that Paddock may have been obsessed with his father, the bank robber who was on the FBI’s Ten Most Wanted list. So, here’s one theory: That as Paddock’s addiction strengthened, it broke down the inhibitions against satisfying unconscious or even possibly conscious cravings to emulate his father and to become notorious in his own right. Again, this is a theory only, and I recognize that there is no evidence at present that Paddock had this craving. But if he did, this might help explain Paddock’s individual behavior. What it does not explain is why these shootings are ever more common. For that we would have to delve deeper, and that’s where the social analysis above comes in. It would also be interesting to know if the other shooters were drug addicts of some sort or another. If so, then again we have to ask why drug addiction is so rampant in capitalist US society? What must be emphasized is that no view of the individual psychology can explain individual actions if the view is taken to the exclusion of the social conditions. That is doubly so when the individual actions are part of a larger pattern (such as random murders of the sort Paddock and others have committed).